Sept 2015 – FaceTime with Kindergarten class. Sometimes her one-liners are lectures. Fall mornings can be a bit rushed. 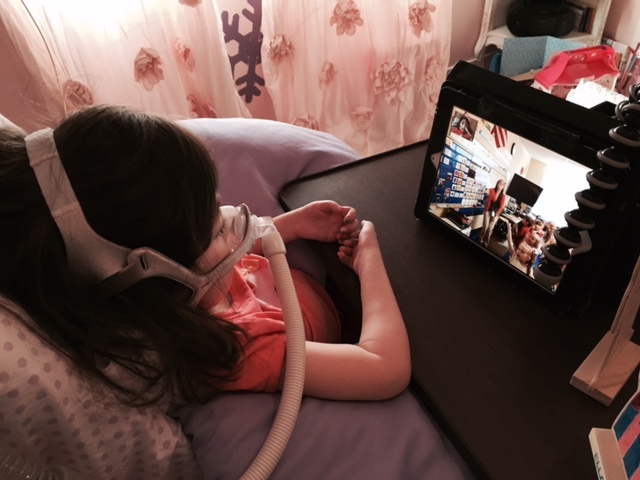 After her respiratory treatment, she gets dressed and does FaceTime with her kindergarten class. This morning, Grandma is doing her best to get dressed in time for circle time. It’s apparently not fast enough for J.
J: I need bottoms. Do you know anything about modesty? Patience is not J’s thing. I’m getting J ready for bed, and she keeps asking for a toy. I ask her to be patient. J: I don’t like patient. M: But God wants you to be patient. J: Don’t worry. It’s still boring! J has been playing with her toy nativity scene. She knows about the wise men with their frankincense and myrrh. 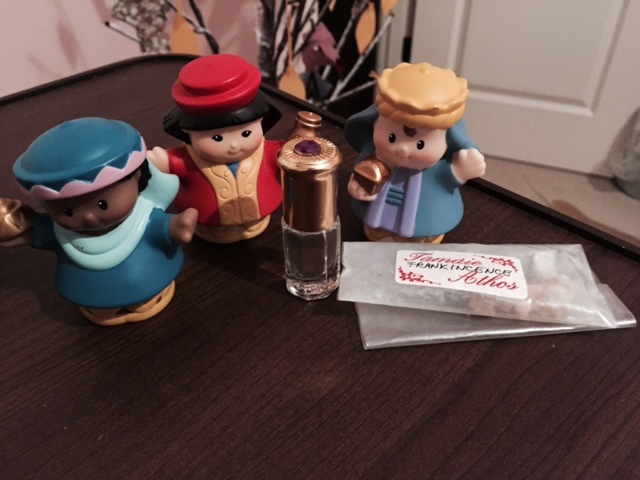 Her amazing nurse (the same one who helped her fly a kite) somehow produces real frankincense and myrrh and presents it to Julianna. She just happened to get it from a monastery in Eastern Europe. Impressive, right? Oct 2015- J with her nativity scene. Wise men with frankincense and myrrh. J decided that the gold top on the myrrh bottle was sufficient. Bedtime is also not Julianna’s thing. Just before bedtime, J asks for a sip of water. I am reluctant because I’m afraid that she’ll choke. She persuades me, takes a sip and chokes. I feel awful. J insists that she’s OK.
J: Julianna is OK even though she choked. Tell God. M: Ok. If you say it’s OK, , it’s OK.
J: God helps everyone. He tells everyone the truth. J: God said Julianna is not tired. Bedtime with J. I’m on my laptop ordering a Mother’s Day present. J: Mom, can you exercise my legs? M: OK, can you hold on a minute while I order something for Homie? J: Not order. You have to say please. J: I’m big, I can walk and I tell people what to do. I just love that girl! 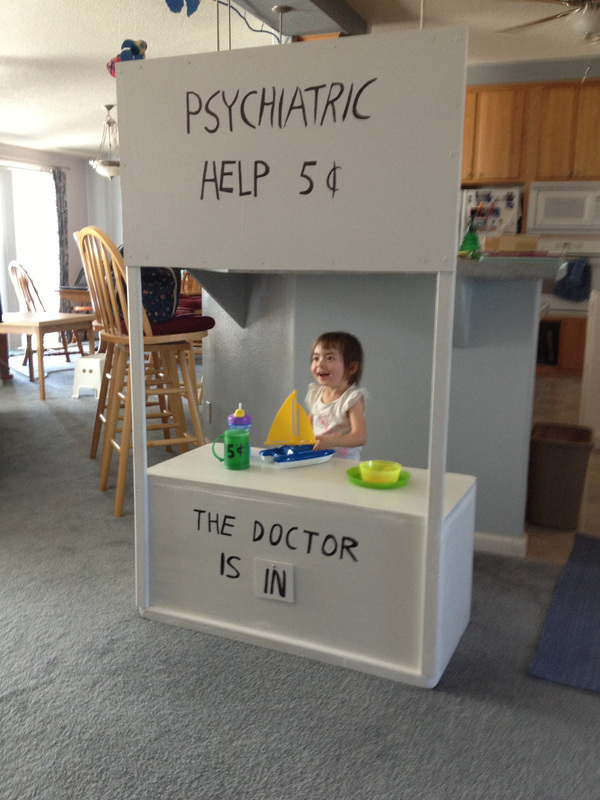 She says it like it is! Thanks for sharing these sweet and sassy moments! The heart of a child is much closer to God then our mortal minds can understand. I look forward to meeting Julianna on day. Salvation is by the grace of God through the sacrifice of Christ by his crucifixion. We could learn much by listening to a child that has walked with Him. Wish you guys the best , wonderful little girl will have you guys in my prayers …. Thank you for your courage in sharing the tragic story of your precious child Julianna and helping to make the world more aware of CMT. I also am a person with CMT, a CMT Support Group leader, a pediatric Occupational Therapist, and a volunteer of the Charcot-Marie-Tooth Association. I sadly know that although rare, there are other families dealing with young children whose bodies are devastated by CMT. Many think of CMT as a ‘mildly’ disabling condition. But we know that due to genetic modifiers, a child can develop much more severe and debilitating symptoms than their parents. Also that others have phrenic nerve involvement which if untreated can result in not only disabling issues but yes, can be fatal. As a person who has helped keep loved ones at home and provide support as they make the transition from this world to the next, I know what it takes for a family to care and provide the support to a loved one. Thankfully your family’s faith is a source of strength in the knowledge that although Julianna will be alone in heaven for a while, she will be joined by her beloved family. What a blessing for all. I did contct the CMT and I hope you have heard from d Pat Livney, the CEO of the CMTA. 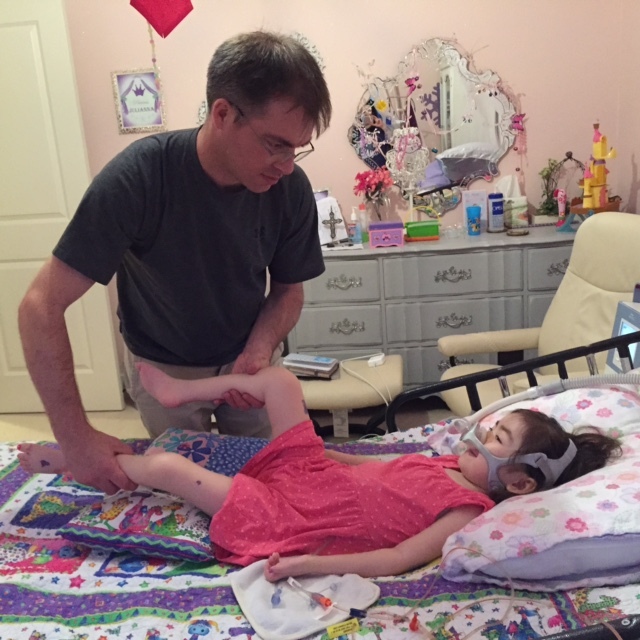 Pat Herb Beron, the Chairman of the Board, or Elizabeth Ouellette another member of the CMTA Board have all read about Julianna and hope to help. . Tthese dedicated friends either are themselves dealing with CMT or have a child with CMT. We really are a family, working together, providing support to those coping with CMT such as our support groups (now over 80 in USA), or providing knowledge through our Patient Family Conferences held 2-3 times each year at different locations across America. The above individuals also work tirelessly on funding research for CMT, working with the International Inherited Neuropathies Consortium led by Mike Shy MD, and establishing partnerships with medical companies to help with the research happening world-wide. I also hope to facilitate any support that you all and your loved ones can utilize. I hope that it helps to know the world-wide community of people with CMT are not only praying for your Julianna but also spreading the word about what can happen with CMT My prayer is that you, and others in similar predicaments of dealing with severe forms of CMT know that we are here, spreading the word, raising funds, and trying to ‘Imagine a World Without CMT”. My sincere thanks for your courage, commitment, bravery in sharing your story with the world.